Gamers want Commander Shepard in their pockets. It goes without saying (but we'll say it anyway) that PlayStation Vita needs big time franchises to be successful. Call of Duty would give the system a huge boost, as would Resident Evil. Imagine something like this running on the Vita. Mass Effect, though, could trump them all. The fact that Mass Effect 3 will grace PlayStation 3 March 6 leaves the door wide open for the possibility of seeing this celebrated sci-fi series on Sony's new machine, which seems like a perfect fit to host BioWare's most popular creation. For starters, the system's powerful enough to do Mass Effect justice. We don't know if BioWare's talented designers can achieve ME3 quality visuals, but that's unimportant at this point, since the device is more than capable of displaying impressive looking graphics. In addition, that second analog stick means BioWare doesn't have to come up with some new control scheme, since it is essentially a DualShock 3, minus the L2/R2 triggers. You'd have no trouble guiding Commander Shepard through the universe. On top of that, Vita's online functionality allows for downloadable content, fed through PlayStation Network. Give us new episodes at a steady drip. To be clear, this would be a new entry in the Mass Effect franchise, and not a port of the original/Mass Effect 2. Vita will certainly have its share of ports throughout the year and beyond. No need to shoehorn some old adventure onto the system, not with Mass Effect Infiltrator coming to iPhone and iPad the same day as Mass Effect 3. For now, all we can do is hope. 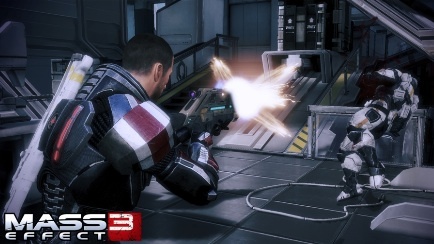 It remains to be seen where the Mass Effect IP goes after part three hits shelves, but we know this much: bringing it to PlayStation Vita would significantly boost the system's appeal, while giving players a thrilling adventure to enjoy on the go.